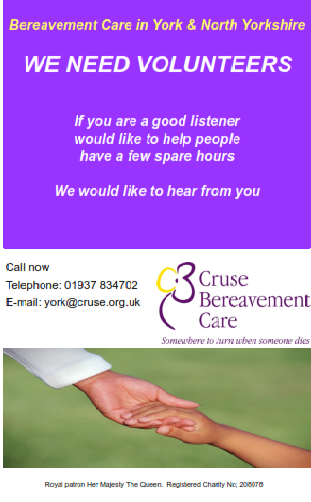 Losing a loved one can be the most devastating experience, but help and support is available through York and North Yorkshire Cruse Bereavement Care. Last year York Cruse provided support to 512 people including 90 children. Our volunteers provided 1391 counselling hours on a 1:1 basis and a total of 6839 hours which included ongoing training, travelling to meet with clients, telephone and email support. Highly qualified volunteers specialise in supporting children and adults. Demand for our services is increasing all the time and we need more volunteers. If you feel you would like to be part of a national charity supporting the bereaved, pleased do get in touch by phoning 01937 834702 or email: york@cruse.org.uk for more details about the next training course.